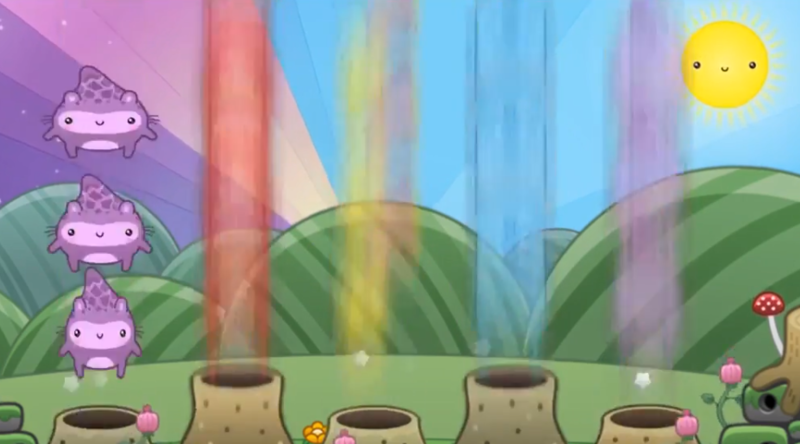 Thunderkick went into the world of fairies and unicorns and minted Toki Time. Toki Time is a video slot game which is probably the cutest slot to have ever been created. It adorns bright colors and vivid shapes. It is inspired by the Japanese glitz and glitters. It is not your conventional slot game as it features a unique setup. It, however, has all the fun stuff like wilds and new ways to increase your wins. The backdrop of this game is created with a rotating sky which transitions from day to night. The screen is also embellished with flowers and animated mushrooms. The soundtrack also adds to the sassy effects of the game. To know more about this interesting game lets deep dive in the review. Toki Time is nothing short of a child’s dream. Its graphics and setup will surely get the child out of you. Toki Time has 5 rows along 3 reels and the players can have a maximum paylines of 11. The total coins range of this game varies from 0.10 to 100. It also has a jackpot with a 500x more than the wager. Unfortunately, Toki Time slot doesn’t have a bonus round and it also lacks the fan-favorite free spins and progressive multipliers. The Return to Player factor of this game stands at 97.1%. This is a good percentage but certainly not the best. However, video slots lately have been slacking in their RTPs. So, keeping that in mind, Toki Time has a good job. The variance level of this is also medium to low, which is certainly a bright side in the game. Toki Time is a standard video slot with 5 reels along with 3 rows. It has 11 pay-lines which remain static throughout the game. But the only thing is that the game is not standard at all. The entire of setup Toki Time is so unique, fresh and fun. Instead of having the reels spin and stop, the symbols emerge from rabbit holes underground. 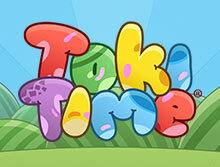 With its stylized and scenic backdrop and symbols, Toki Time is a winner. The symbols used in this game have brightly glistened animated characters inspired by Japanese anime. They include 7 cutesy symbols which are in colors red, green, purple and yellow. Along with them, you will find a start and a cloud. The wild symbol of this game is a character which is sheep-like and only pops at reel 2/4. Read about their significance down below. Players can start spinning their reels from a menial cost of 10p. This prize can go as high as £100 per spin. The adorable creation of Thunderkick has its own quirky and fun bonuses and additional features. Since this game is completely out of the ordinary, it will be fun to know about their bonuses. Read on to know them in an in-depth manner. Win Both Ways: You may have heard about this feature as some video slots have it. In win both ways, the winning combinations are created from both right and left side. This makes more sense in Toki Time as the game only has 11 pay lines. This makes for winning rounds. Expanded Wild Respins: The game features wild respins which can be expanded. To trigger this, you need to be on the lookout for the sheep symbol in the game. When the sheep symbol pops from the underground and lands on reels 2/4 and then fills the entire reel is when the feature gets triggered. As when this happens and you get winning combos, you will be rewarded with free spins as long as the sheep stay in the reels. This ought to give you big wins. You can be sure to win a chunky pay-out which can even be a whopping amount of 2,400 coins in one go. The simplicity of the bonuses in Toki Time can be frustrating as the rest of the aspects of this game are pretty fancy. The games don’t come with shiny bags of lucrative features. The only ‘real’ feature to expand your earning is the expanding wild feature which we just explained. However, winning in the games becomes much easier in comparison to other games. This is because Toki Time has the option of winning from both left and right directions. Toki Time is an excellent slot created by Thunderkick Games. The slot can be addictive and compelling. Though the players may expect more on the bonus and features front, this game maintains simplicity in this regard. The graphics, soundtrack, and backdrop are really appealing. While the RTP of this game also stands at a better-than-most rate of 97.1%. After a point, you may find the music to be a bit overbearing but then mute buttons will come for your rescue. All in all, we like this game and totally recommend it. Given its medium variance, you have nothing to be afraid of.